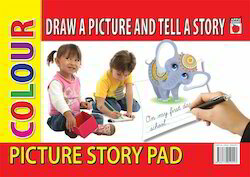 Our product range includes a wide range of draw a picture and tell a story. We are renowned as the flagship exporter of Draw A Picture And Tell A Story. These books are designed using superior quality of paper & printing ink in accordance with the quality standards. Our offered books are thoroughly checked by knowledgeable professionals in order to ensure their correct concept and correct content. We offer these books in numerous customized options at reasonable price. Looking for Paint by Numbers ?